Today I am going to step away from my usual format and tell you a story about a most incredible person. This person is not from Cincinnati and probably did not even like Cincinnati very much. But he left a mark on my life and I want to take this opportunity to tell you about him, to eulogize and to memorialize the life and death of Mr. Edward I. Zukowski. Please first allow me to introduce you to the man, and then I will tell you why I feel compelled to document my association and knowledge of him. He was a true American war hero, and much more. Mr. Zukowski was born In Buffalo, New York, ion February 19th, 1916. He served in the U.S. Army during World War II in a most heroic fashion. He served his country as a tech sergeant in the United States Army, initially in Hawaii and later participated in the first wave of three invasions covering Algeria- French Morocco, North Africa, Sicily and Omaha Beach Normandy, France. He was injured in enemy action near El Guettar, Tunisa in March 1943. He was the recipient of no less than fourteen medals and honors including two purple hearts, two Presidential Citations four bronze stars and the Silver Star Medal for extraordinary heroism. 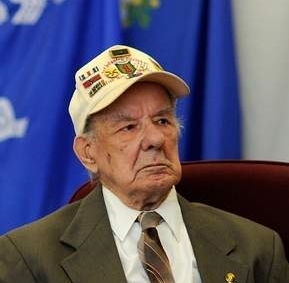 In March 2012, at the age of 96, Mr. Zukowski was presented with the French Legion Of Honor Medal, the highest award bestowed by the French government in recognition of his contributions during the D-Day landing on Omaha Beach in Normandy. He was a member of the forty men in the platoon that landed that day, only eighteen survived. Mr Zukowski’s own memories of that day were clear and vivid. “We’re dying here on the beach, let’s go. We were going through barbed wire and I triggered a wire on an anti-personnel mine, but my rifle was on my left side and it took most of the shrapnel, the stock was splintered all to hell,” said Mr. Zukowski, who still had two pieces of shrapnel that hit him. He was wounded in both legs and left arm, was “patched up” by his assistant and urged his men to keep on going. He laid there on the beach for 14 hours and was almost run over by a tank before being picked up by medics. His brother, Joseph Zukowski, also a soldier in the first wave, was killed that same day. Here is where the story gets personal. Edward Zukowski was formerly my Father-in-law. In 1975, following a dissolution of my marriage, my ex-wife and two children left Cincinnati and moved to Shirley Massachusetts. Mr. Zukowski, by then retired, stepped up and filled the void left by my becoming an absentee father. He was the role model for my children, an a role I was unable to fulfill living one thousand miles away. He was everything to them that I should have been, but was not. I consider him mostly responsible for the fact they both became well-rounded, productive citizens and responsible parents. He, more than anyone, guided them down the path of life, in the right direction. He willingly stepped up and did for them what I did not, or could not, or would not do. And for this I am forever grateful. A debt of gratitude that I will never repay because Edward I. Zukowski passed away on August 31, 2014. One final note that truly describes the gist of what this man was. In his final few hours, a priest was summoned to perform last rites. The priest commented “Oh Eddie, my friend. You have nothing to worry about.” I was not there to ask the priest the meaning of his words, but I am certain he was saying that because of the good life, and all the good he did in his life, his eternal life in heaven was guaranteed and for that reason he had nothing to worry about. So goodbye, Mr. Edward I. Zukowski, The world is a better place for you having been here, and we who knew you are more fortunate than those who did not. Rest in Peace. Just one small correction. My brain fused bits of the last rites together and I got it muddled. Beautiful nonetheless. It was so sad and so inspiring at the same time. The lite rites was moving, but not nearly as moving as Father Derosier’s reaction when he realized who he was giving last rites too. That’s sort of what I was trying to express with my clarification. What a beautiful memorial and such honesty on your part giving Mr. Zukowski credit for his devotion to Tim and Jen in your absence. That takes a different sort of courage. He must have been a most amazing and wonderful man! This is beautiful, Mr. Lind. I have been close friends with your daughter, Jen, since 1985, and I admire you for giving Pop so much credit for the people that Jen and Tim have become. He was a wonderful man, and though I am awed by his service to his country, Pop was so much more than a war hero. He was an everyday kind of hero too, and I thank you for writing about that side of him. Best to you. Thank you, thank you, thank you sir for your heroism and dedication to your men and this great country. What a great example of how to be a patriot and a MAN. The world is a little darker and lonely place with your passing. I stand all amazed at these great men and women of “THE” greatest generation. RIP Mr. Zukowski. Tom thanks for sharing this information about this great man. Dad, this was just beautiful. Thank you for writing this. I am moved in ways I simply cannot express.